The company Ventria Bioscience has provoked controversy by growing an experimental diarrhea drug in rice genetically engineered with a human gene. Environmental groups, food corporations, and farmers have managed to keep Ventria's rice farms out of California and Missouri, and they continue to allege that Ventria is recklessly using untested technology. Will it Mix With Food Crops? Ventria's rice, now grown in North Carolina, produces two proteins found in human milk, saliva and tears, which could help reduce the severity of diarrhea attacks. Diarrhea is a leading killer of children in developing countries. 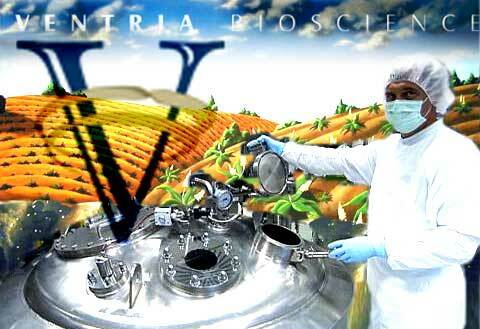 But many fear that Ventria's experimental crops will intermix with food crops, rendering them unsafe to eat. At the same time as companies throughout the world are bioengineering new crops, the UN Food and Agriculture Organization warns that natural wild banana species could soon become extinct. Without wild bananas for hybridization, the world banana crop, threatened by disease, could very well collapse. I am absolutely convinced that genetic engineering is one of the most significant threats to the future health of this world. I am currently in the process of writing a book on this topic that should be out in 2007. I am equally convinced that Monsanto is one of the most evil companies I have ever reviewed. They have manipulated the legal system to actually be able to patent their destructive changes and sue innocent farmers after their manipulated plants have infected their fields through the process of natural pollination. Folks, it doesn't get much more morally reprehensible than this. Monsanto's plans to control the future of food in the world are literally some of the most frightening issues I have ever encountered in health. Last year I ran an article about Ventria Bioscience, and their practice of growing transgenic rice containing human genes. Unfortunately, Ventria was granted clearance in March from the U.S. Department of Agriculture (USDA) to expand its operations to some 335 acres near Greenville, N.C.
Ventria has petitioned the FDA for approval of its protein powder used to fight diarrhea, not as a drug but a medical food, which means it wouldn't require extensive human testing. And, despite growing opposition, the company has a long-range plan of adding its unnatural protein product to baby formula, although food manufacturers aren't interested. The company claims it's virtually impossible for its genetically modified rice, when mixed with conventional crops, to create a deadly product. Nevertheless, it's a certainty that they will mix at some point and, when that happens, who really knows how these Frankenstein-like crop combinations will affect your health. Hybrids between GM plants and wild plants have already created weeds resistant to herbicides. Now we are presented with the frightening possibility that medical drugs could end up in our food supply. The effects of genetic modification on the environment and on our health are unknown. Essentially, it is a massive and risky experiment on the whole human race and the earth's biosphere. And it isn't a question of whether or not GM plants will mix with non-GM crops; they will do so. We do not have control over the wind, the birds and the soil. And while GM crops continue to proliferate, some natural, healthy foods may get killed off. Unless something is done, there may come a time when a natural banana is unobtainable, and only genetically modified varieties remain, with all the potential risks to your health that entails. If there isn't a concerted effort to favor natural foods over GM foods, and soon, the human race will be making a dangerous gamble with their physical health and fragile biosphere. Unfortunately, you've probably eaten GM foods, because there's no labeling policy forcing manufacturers to list them on food labels in America. And at least seven out of 10 items on the shelf have been genetically modified. There are, however, ways to identify GM foods. Avoid processed foods. Some 75 percent of processed foods contain GM ingredients. Read produce and food labels. GM soybeans and corn make up the largest portion of genetically modified crops. When looking at a product label, if any of the ingredients are corn flour or meal, dextrin, starch, soy sauce, margarine, or tofu (to name a few), there's a good chance it has come from GM corn or soy, unless it's listed as organic. Buy organic produce. Buying organic is currently the best way to ensure that your food has not been genetically modified. Food that is certified organic is by definition free from all GM organisms. Look at produce stickers. Those little stickers on fruit and vegetables contain different PLU codes depending on whether the fruit was conventionally grown, organically grown, or genetically modified. The PLU code for conventionally grown fruit has four numbers, organically grown fruit has five numbers prefaced by the number nine, and GM fruit has five numbers prefaced by the number eight. Related: Pharming Underground - Can subterranean laboratories ease safety woes over crops that sprout medicine?